For the third year in a row, I’ve gone to the trouble of obtaining several quarts of heavy cream (whipping cream) out here in the Alaskan bush. It’s an item our Native Store doesn’t stock. The past two years, I’ve paid a tidy sum for a grocery store in Fairbanks ship out cream on a cargo plane. Another year I happened to be visiting a village where the Native Store did stock heavy cream; I hand carried several quarts of the precious liquid on the bush plane back to our village. We love homemade ice cream, so it’s worth the trouble. And we like variety. Last year, I experimented with eleven different flavors of ice cream and sorbet. We treated guests to rocky road, toasted almond, fireweed and honey, peanut butter chip, toffee crunch and more. This year, I stretched my ice cream making wings a bit further by experimenting with new flavors and by improving last year’s favorites. I’m happy to report that all of this year’s batches turned out terrific. One of the biggest hits has been this year’s vanilla. Heat cream in a medium saucepan over medium heat. Add vanilla paste and heat until mixture almost boils, about 5 – 8 minutes. Meanwhile, beat yolks and sugar until the mixture is light yellow and smooth. Add 4 tbsp on hot cream mixture to egg mixture and stir until combined. This will temper the eggs. Slowly add warmed yolk mixture to warm cream. Stir continuously in order to not cook/curdle eggs. Cook entire mixture over low heat until slightly thickened and mixture coats the back of a spoon. Cool completely. I put the mixture in the refrigerator overnight before I use it. Pour into freezer bowl of ice cream machine. Turn machine on and mix until mixture thickens, about 20 minutes. Transfer to airtight container and place in freezer until firm, about 2 hours. We all scream for ice cream..
Yum! Would love to try this in our Kitchenaid. We’ve done similar but not with the vanilla paste. 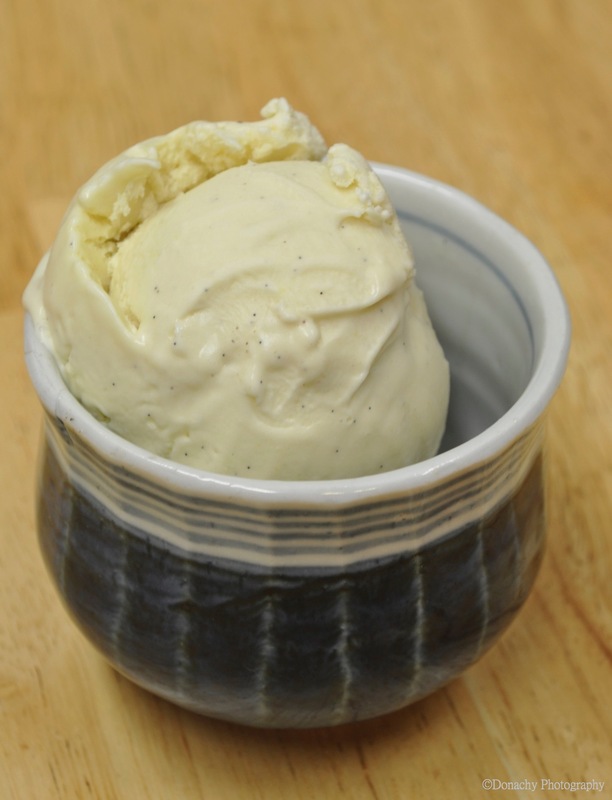 This recipe for vanilla ice cream looks to be the best yet. Can’t wait to try it…..
It’s definitely one of our favorites. Enjoy! Dear Barbra & Jack, thank you for your ideas on recipes….. Thanks for reading and commenting, Juliane.